Though I have to admit, I was not feeling very well on Friday as I came down with a heavy case of the flu and was in such bad shape I had to take a day off from work so I could go home. That night I couldn’t sleep at all as the flu made it lousy couple along with my insomnia problem I was having for the past few days. Then at 1am I got a text message from Fuminari saying he was coming down to KL for that weekend’s roadshow and he had passed up a chance to shoot a photography model shooting contest up in Penang and asked if I wanted to meet up. So we set a time and place and that was it, I decided to take some strong meds and quickly fell asleep. The next day, I woke up feeling better but the flu was still there. So I packed my stuff up along with m meds and headed then where I then met up with Fuminari at BTS. But after a while we asked the people at the roadshow what time were the GT queens coming and it was mentioned to us that they weren’t coming today! WTF?! 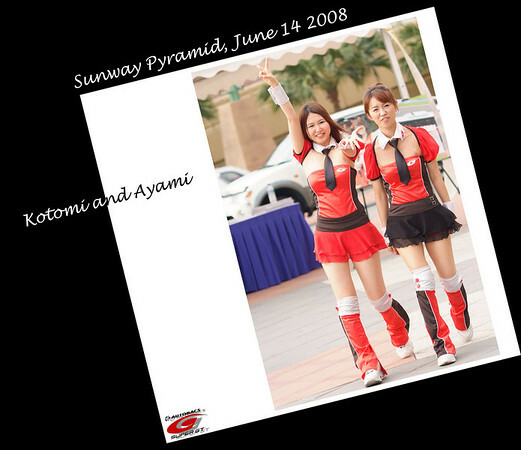 Then we got a lucky break, one of Fuminari’s friends informed us that the girls were at Sunway Pyramid. Drat that was a hell of a distance from BTS to Sunway pyramid, especially with the petrol hike. But I would be DAMN if I missed this chance! So I bit the bullet and drove all the way there in an hour’s time. Where we waited for the girls’ next showing there and when they did, Fuminari passed them the gift he had brought all the way down……talk about fandom. So to summarized the shoot, we went wild taking photos! Because a lot of other photo kakis were there as well, I only managed to get a few shots so I had to be creative with how I worked my photos. Tip here: When shooting events, don’t feel bad if you can’t score any obvious keepers from what you have taken of the events. This is where a whole new set of creative skills is needed, namely Photoshop. This shot was literally leaning itself for this, I needed to find something to fill the space between their hands so I decided to put the super GT logo. It was rather hard to find a hi-res version as all the ones on the web were low-res ones even on the official website. The only hi-res one I could find was on the flash banner, so using Mac’s built in selective screen capture (command-shift-4) I copied it out. I had also decided to try out a new setting I’ve been working on in lightroom but I was worried I would be over using but like a friend told me, don’t worry about overusing something. This is hobby, use what you like and not worry about it. Though he also said some people might not like it and I should be prepared and open to criticisms. It should be noted this is best seen on a white background………….Though the effect I’m working doesn’t seem to work well with this one…….Well tip here, keep trying and enjoy! My favorite shot, taken using my nikon 17-35mm. I SOOOOOOO love that lens! 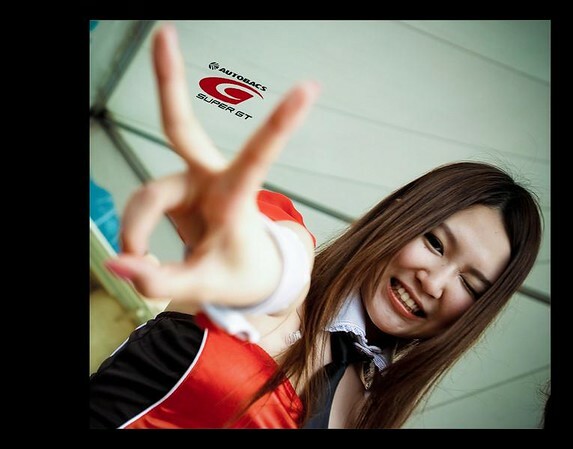 So I hope you enjoy these photos until the actual super gt event this weekend at Sepang. Till then, pleasant dreams~! !